More photos and text after the jump! I don't have a giant yard. But it's big enough to practice photography. And I practice everything. Composition, focusing, exposure, depth-of-field, flash, macro, night photography, dogography. And I fiddle with the settings on the Nikon D5100, trying to learn which are most useful and how to use them (the different focus settings, for example). My philosophy is simple: if I can take good pictures in my yard, I will be better prepared to take good pictures when I get to the good places. If you really stop and look, yards are actually kind of interesting. Most are home to some birds, insects, interesting plants and small wildlife (by which I mean squirrels). Maybe it's not the Grand Canyon, but through a lens there may be more than meets the casual eye. I sometimes do some writing at home at a picnic table in the backyard. I usually have my Nikon D5100 on the table with the 70-300mm telephoto lens attached. One day I was fiddling with it and noticed the leaves of a plumeria plant looked pretty neat against the blue door of our garage. And then I noticed a butterfly flitting about. 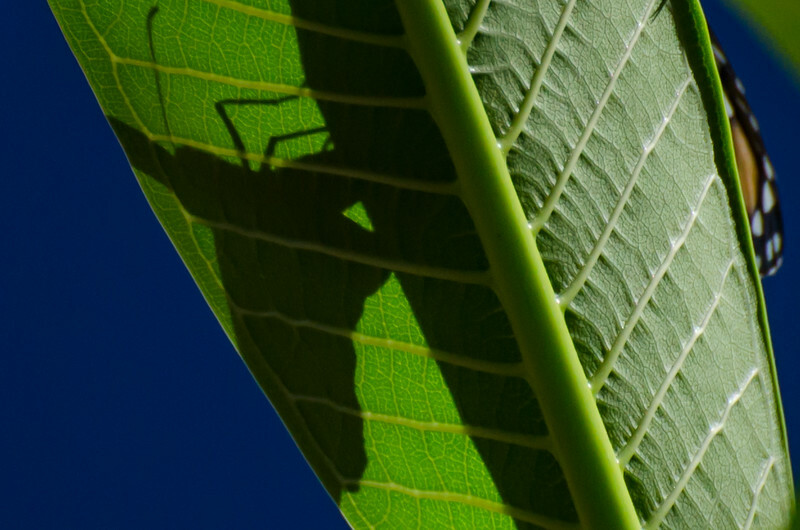 Long story short: butterfly lands on backside of leaf, I get a nice picture of the silhouette of a butterfly with bright blue in the backyard. That's the second photo above. 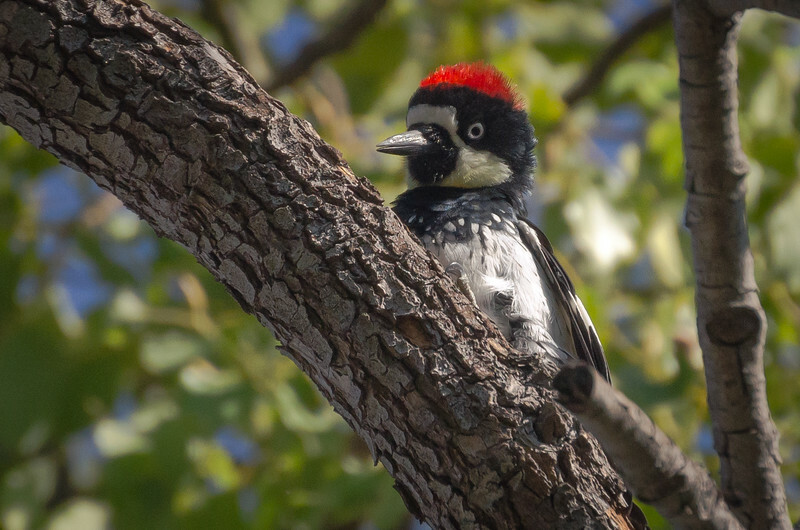 The top photo is an acorn woodpecker. They're all over the neighborhood. This one was in a tree branch that extends over the table. I watched him land, quietly picked up my camera and got a decent shot. 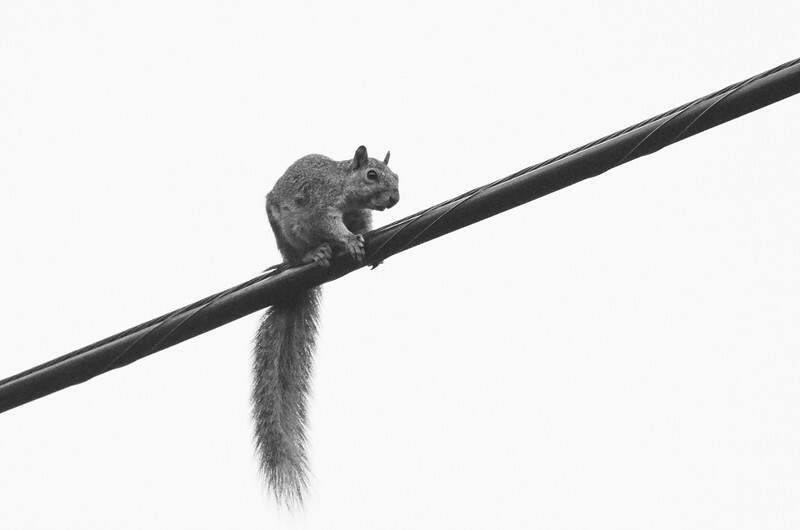 The squirrels use the wires all the time. I've actually gotten closer to them when on the ground or the garage. But I started playing around with this photo in Lightroom and came up with something interesting. The fourth photo, of the flowers: that's with my new macro lens. I took the photo when trying to learn how to focus the lens, which has an insanely small depth-of-field. We have a bench in the back of the yard. If I sit there quietly for a while a bird is sure to land on a snag in the neighbor's yard that is nearby. 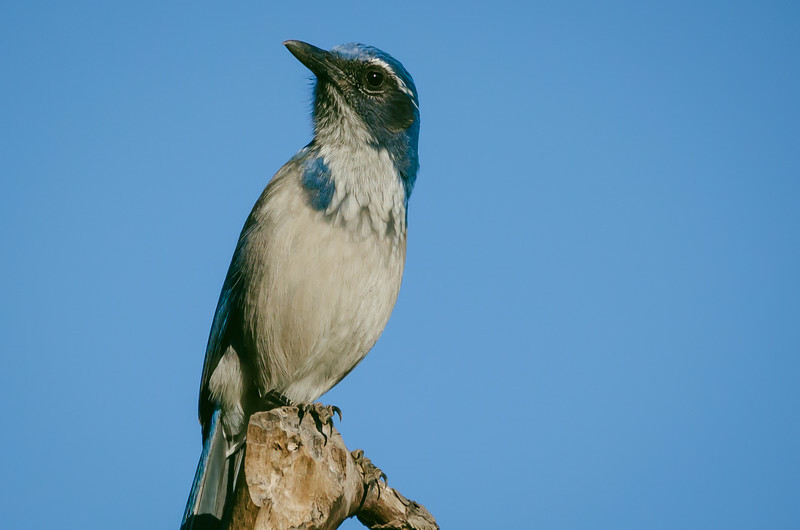 Scrub jay lands in late afternoon light. I get a nice sharp photo when he turns his/her head just right. A couple of other recent yard shots with my new Nikon 85mm macro lens are at this recent post.